The participants continued on with the topic of co-operation and specifically the various forms of co-operation. Where as yesterday they were given 7 role illustrations to analyze, the groups now had to work out what types of management tasks would be used in each model. Once these were presented to the rest of the team, the trainers used the network group of ESD leadership training in order to give an example of a real life situation where these forms are used in co-operation. The participants were then asked which model/illustration they felt the network belonged to. Fabian Zimmerman gave his input here by stating he felt it was a mixture of a club, forum and expedition. The latter was an important issue when thinking about how this training is only the pilot training course. Following this task, the group then received an input from Birgit Lane on the topic of co-operation relating to ESD. As I had written in yesterdays blog, birgit has a lot of experience with ESD and therefore was able to present this issue to the group. She spoke of an organization called ‘KATE’, which was set up in the GDR in 1988 which built itself up using a number of co-operation forms to do so (e.g. club form after creating rules and a degree of formality). The company then got involved in local agenda 21 and collaborated with NGO’s in Germany (Berlin especially) and a number of Southern American countries. She went on to discuss then how KATE eventually formed some very strong relationships which she likened to the ‘marriage’ form of co-operation. As this was an overview from practical experience of the topics it was therefore very complex but gave the participants an example of how different management tasks can be used within various forms of co-operation. A group task was then set for the participants to access and analyze the stakeholders involved in chosen innovation projects. Fabian Busch firstly gave a definition of a stakeholder and the difference between this and share holders (I.e. that shareholders are also stakeholders). 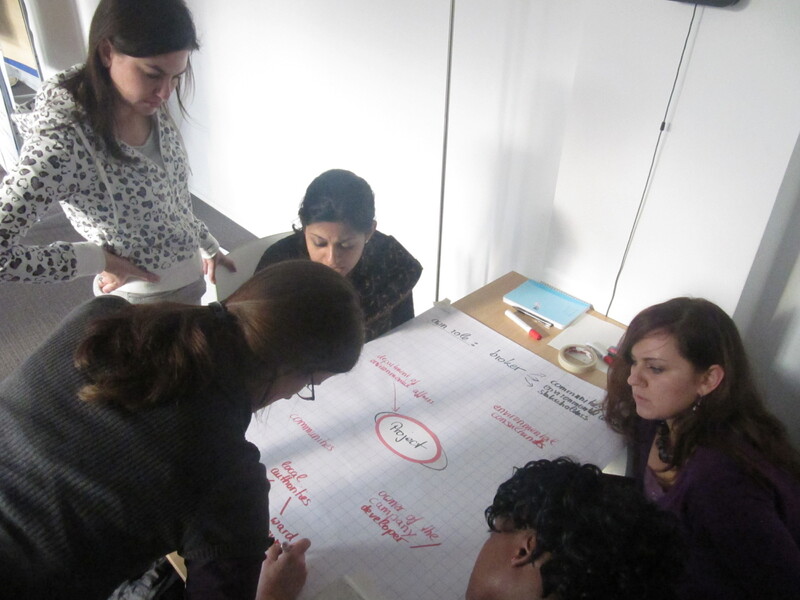 The participants were therefore given a number of tools to facilitate this analysis and apply it to the projects. They had to firstly discover what their own role is within the project and once they were able to pinpoint their role, they were required to do stakeholder mapping. Lastly the second tool for co-operation is that of cost-benefit analysis. The participants were given knowledge of using this tool and it was then further discussed until the close. Tomorrow the class will study negotiations and the Harvard communications approach.